The pet grooming tool combine bath brush and water sprayer. Not only can take shower for pet, but also massage. It like giving your dog a mini spa experience. This hand held sprayer comes with 8 feet long hose and 2 hose adapters are provided along with the packing. The adapter is compatible with standard showers and garden hoses. No need to buy extra components. We hope this pet shower tool will satisfy you . 1.Quick-connects to 0.6 inches standard external thread back yard faucet and 0.9 inchs bathroom sink internal thread faucet and bathtub internal thread faucet. Versatile: Our pet bathing tools combine showers and brushes to bathe and massage your pet. Suitable for all sizes:Dog bathing supplies is adjustable-length wearable design fits closely to the size of each person's palm,flexible operate during the bathing process. Professional Level: Pet Shower Bath The perfect water pressure and soft brush can ease the stress of anxious pets without worrying. 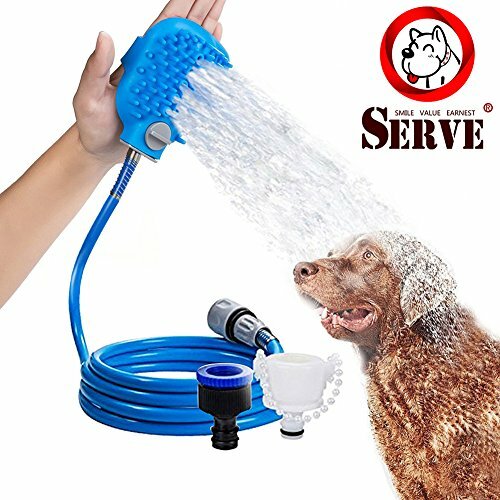 Innovative design: The knobs control the flow of water and allow for easy water saving; the rims at the connection are reinforced to prevent the hose from swaying and being damaged; dog bath accessories of the soft brush can easily comb pet hair. Easy to use:Pet shower tools for 2 hoses fit the standard 0.6 inch male for indoor and outdoor use. If you have any questions about this product by SERVE, contact us by completing and submitting the form below. If you are looking for a specif part number, please include it with your message. Mugzy's Mutt Towel: Awesome 100% Microfiber pet towel attracts but won't trap fur - 28" x 50"